USB SENSOR MEASUREMENT SOLUTIONS - Robert Owen Inc.
Use a Windows PC with Excel installed, for sensor measurement, with ROI-USB sensor converters. ROI-USB adds sensor measurement to a PC. 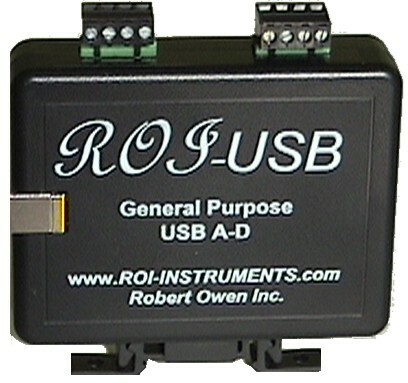 Monitor sensors, sensor transmitters, and instrumentation signals with the ROI-USB. Signals recorded directly into Excel. Real time live data continually updates, adding new values to lists, charts, etc. PC powered, Windows compatible. Perform live analysis of your sensor data in your Excel spreadsheet. PC powered by USB port measurement. Create charts and graphs that automatically update with data from your ROI-USB. Compatible software tools, turn the USB-A-Ds into Data Acquisition Systems. Software tools; turn Excel into a real time display and data acquisition program. Collecting temperature data with your computer is about as simple as it gets. Simple to use Microsoft Excel, can now be configured directly by the user; as a custom data acquisition solution. For real time temperature trend plotting and active temperature profile measurement; use the ROI-USB, as a real time with Excel Thermistor Temperature Measurement Solution. Not seeing USB SENSOR MEASUREMENT SOLUTION you’re looking for mentioned?